Marketing your startup is perfectly synonymous with the old phrase ‘easier said than done’. More often than not, the expenses and efforts attached to getting your name out there and grabbing attention sink the boat even before it sets sail. So, to put aside your startup marketing woes, we spoke to 45 entrepreneurs and marketing professionals to share their favorite startup marketing tools and how it helped them forge ahead. Read on! 1. Gilles Bertaux is the CEO of Livestorm. If the customer adds a comment with their rating, we send that to our product management app productboard to file it as a product request. If the customer gave us a high enough rating (8+/10), we automatically send them a follow-up email with Customer.io asking them to give us a rating on public software comparison platforms like Capterra and G2 Crowd. If the rating was negative, we automatically create a ticket on Intercom so that our customer reps can follow up and ask what didn’t go well and try to find a solution to make it right with the customers. This process has helped us gather valuable feedback, gain positive reviews, and also enables staying in touch with disappointed customers. Looking for a .tech domain for your startup? Get it here! While I am big time into using paid tools, there are a few free ones that I really love and appreciate. Keywords Everywhere: This is a free Chrome extension that allows me to quickly analyze keywords in terms of traffic potential and competition. If you search for any term in Google, it will show you the monthly search volume for that keyword. At the same time, it also shows the volume of related keywords which appear at the bottom of the page. This really helps in doing some quick keyword research before I move to the paid tools. AnswerthePublic.com: This is a free website that shows the common questions people are asking about the keyword I specify. This is of great help as it allows me to create a piece of content that is comprehensive and useful. I often end up getting a lot more ideas when I use this free site. I have a very visual product and benefit from excellent pictures and videos. As a boot-strapped eCommerce owner, two of my favorite tools are GIMP and HitFilm Express. When working on an online store, it’s important to have some Photoshop skills. However, Photoshop is expensive, and so GIMP makes for an excellent replacement. GIMP is a powerful image manipulation program. You can add layers to images to create white backgrounds for products, or you can distort images using high-end image retouching, restoring, cropping, resizing, drawing, creative photo manipulation, color correction, etc. GIMP is not only free and powerful, but it’s a lighter program than Photoshop. Which is easier on your computer, requiring less RAM. GIMP is also very compatible with opening Photoshop files. Another one of our favorite marketing tools is instructional videos. HitFilm Express has proven to be a powerful, basic video editing/creation tool. HitFilm Express is free software that offers the ability to add music, voice-overs, transitions, image distortion, text, and other features that help in creating great video marketing material. 4. Steve Pritchard is the Founder of Cuuver.com. WordPress has been a dream tool for me. It is one of the simplest CMS platforms available and it gives you the chance to design exactly how you want your blog to look. This helps you to establish a brand tone of voice. The countless add-ons that you can download offer a wide range of perks, from creating meta tags and title descriptions for the best SEO results to ensuring your blog suits the house style of the rest of your website. Furthermore, for content scheduling tools, WordPress is ideal. Blog writing, for a new business, is essential to help your SEO. WordPress is a big help for this because you can schedule blog articles as far into the future as you like; as a busy business owner, you might write five articles in one day and then not have time to write another one for a month. So, having a scheduling tool is perfect for ensuring your site is consistently updated with new content. When it comes to startup marketing, one of the most important things is to get your name out there. Ship from ProductHunt is a brilliant option for garnering early interest in your product. ProductHunt itself is a great resource for startups – it’s a community where you share your product, and people can upvote and comment on it. Ship could be considered the more ‘premium’ option from the guys at PH – and it has some super neat features. You can build a snazzy landing page for your product and embed widgets and email forms into your site to send people to your PH page. You can interact with your users to find out what people like, and dislike, about your product in a way that hasn’t really been possible in the past. The platform also offers A/B Testing built-in and analytics, so you can track how people interact with your landing page. Once your product is launched, there’s no better marketing channel than Word of Mouth. Leveraging ambassadorial early adopter users is an absolute must. GetAmbassador would be my pick as a tool to do just that. GetAmbassador simplifies the referral marketing process into 4 steps: identify, enroll, track, and reward. Everything you need sits neatly in the platform – from finding the ambassadors you want to represent your business, to track who is generating the most buzz (and revenue!) and to optimize accordingly. Using these two tools is a great 1-2 punch for startups looking to kick off with some major growth. The demand for tools that facilitate access to multiple social media accounts and the monitoring of brands and products across social networks has popularized the use of HootSuite. HootSuite is a tool to manage several social networks from the same control panel. I use it mostly for the management of Twitter. Facebook, Google+ and LinkedIn I usually manage directly from each platform. 7. Nate Meadows is the founder of Digital Radar. A large part startup marketing requires understanding what made or is making their competitors successful. Or, conversely, what isn’t making them successful and seeing what gaps they have. Buzzsumo – If you want to see how your domain compares to another, study the content marketing analytics of your competitor or an aspirational company. You can also use this tool to see how your competitors’ Facebook page is performing. Two additional features of this tool our agency finds extremely helpful are the ability to find influencers and the question analyzer. FollowerWonk – Optimizing your content is important, especially for the waterfall of content on Twitter. You can easily compare your content send times against when your followers are most active or use this tool to see when your competitors are talking then optimize your send times strategically to have more share of voice. SEMRush – Getting a peek behind the proverbial competitor website analytics curtain is powerful. How much traffic are they driving, who are backlinking to them? And, what keywords are they optimizing for? Utilizing this tool you’ll have a wealth of information to incorporate into your marketing strategy and optimize your marketing efforts in a more strategic way. My favorite content marketing tool is Quuupromote. It is a paid tool where you can submit your content to relevant influencers in your niche who can then share or link to the content. You can receive hundreds of social shares, mentions and clicks if your content is decent. It saves you having to do a lot of manual outreach. You can also get some highly relevant and high-quality backlinks also if your content is top quality and useful. 9. Terence Channon is the principal of NewLead. Startups must immediately begin using Facebook Business Manager for your Facebook pages. Many companies, both start-ups and established, operate Facebook and share access using the standard method to grant access. Transitioning your page to a Business Manager account gives you ownership of the organization’s social media presence and it also makes it much easier to invite other employees or users to assist with your social media efforts. Business Manager provides advanced and robust reporting options to evaluate the performance of posts, campaigns and other Facebook activity. Business Manager also enables improved collaboration among participants with access and ability to better execute marketing campaigns. Leveraging this also adds privacy for the business owner as well as employees. With Business Manager, the business owner and employees are not required to be ‘friends’ with each other on Facebook to share access to the page. Lastly, the organizational control and ownership is a great exercise in corporate governance and an important mindset to be in. Business Manager eliminates the risk of a former employee or founder usurping control of the social media page and causing damage through action or simply inaction. E.g., we see many startups that hire a social media consultant to set-up the page on behalf of the organization, things don’t work out and the consultant doesn’t reply to requests anymore – yet still has ownership rights to the page). Best of all, Business Manager is free to use, is exceptionally supported by Facebook and is a simple transition. 10. David James is the founder of Business Growth Digital Marketing. If you are looking at business development, then you want to use a CRM that will help you monitor your sales pipeline. Streak CRM does that. But when you combine it with Gmass, it can help accelerate your business development at scale. I put together a short guide to help understand the tool. This tool is brilliant for capturing leads and improving your website’s conversion rate optimization (CRO). I use it to go as granular as possible to identify what is and isn’t working as quickly as possible. In a startup, there are so many things that you need to work on that it becomes difficult to manage your time. So, it is essential that you allocate specific times to do certain tasks so that you complete as many tasks as possible. A Pomodoro or focus timer will keep you accountable for the work that you conduct in your business. Asana is a freemium tool. It allows you to manage tasks with your team and you can even configure it with other apps. This will help you manage your projects well. It’s easy to make typos and this tool helps you to correct all your spellings, punctuations, and grammar for your emails and Google docs. There’s a free version, but you can also upgrade to the paid version. It’s not worth letting a spelling error cost you a contract. Attention to detail is very important. 11. Jason Berkowitz is the CEO of Break The Web. As an SEO agency, we look for tools that can act as a “swiss-army knife” of sorts. For a marketing campaign, we not only need tools that can perform various audits but also look for a lot of opportunities. For longevity in the SEO game, many startups go the content marketing route which can be the best way to achieve free exposure. For this, we use Ahrefs. Aside from all the different competitive auditing, Ahrefs has a toolset for finding content gaps & content marketing opportunities. At the click of a button, you can see the search terms that your top 3 competitors are ranking for. You can also see the most trend-worthy topics in your industry, so you know the type of content to produce (Content Explorer). This information is crucial for any content marketing campaign as you can see how many backlinks, and social shares go to some of the trendy topics. Hot Tip: The Content Explorer shows a “Who Tweeted” option so you can reach out to influencers that had tweeted competitive content. If they tweeted your competitors content, why wouldn’t they like to tweet your content? Furthermore, their keyword research platform (Keywords Explorer) makes it easy to find a low hanging fruit. The all in one screen helps you capture the data metrics behind the top 10 rankings (backlinks, top ranking keyword, ranking history) so you can set realistic expectations for your marketing efforts. 12. Carson Schenk is an entrepreneur and a partner at Art’s Cube. 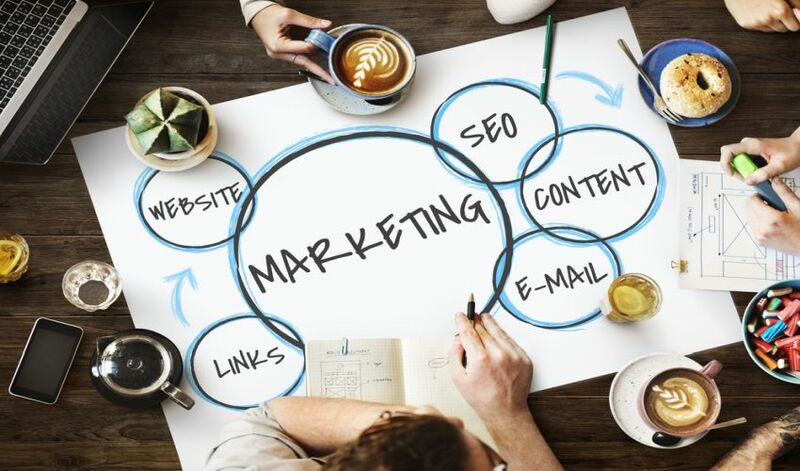 As an entrepreneur, exploring different marketing tools to spring you forward in today’s rapidly changing landscape is essential to your startup’s success. Today’s SERP’s are continuously changing their algorithms to create a better end-user experience. Developing proper and successful SEO campaigns can be a challenge, even for experienced marketers. Using a tool like SeRanking can help in measuring your website’s keyword ranking, competitors ranking, social media management, and much more. This is a paid service that integrates with many free tools, like Google Analytics, to help you measure actionable analytics. Examining analytics from your audience and user base will help you tell a story and optimize your story for SERP rankings. Creating great unique content remains the king for search engine rankings. But are you also distributing your unique content directly to your audience? Email distribution remains a high priority in content distribution. MailChimp offers a great system for newbies and experienced marketers. MailChimp offers easy integration with platforms like WordPress, Facebook, and Shopify. Easy to design drag and drop email templates will make you look and feel like a professional. This tool is brilliant for startups with a small database. For databases with 2,000 or fewer subscribers, it is free. 13. Keith Baumwald is the CMO of Celsius Network. For effective startup marketing, make sure you are using Zapier. This tool allows you to tie all of your other SAAS products together. For instance, you could get a signup on your website through Sumo and then use Zapier to send it automatically to a mailing list on MailChimp. You can then check that email for more info on Clearbit, send the email and additional info from Clearbit to Pipedrive (a CRM tool), then push that same info into Intercom in case they chat with you or register on your site and then push this info into a Slack channel to update your team on who’s signing up on your website. Once you get this setup properly, the process is totally automatic. 14. Cliff Jackson is the co-founder of Philadelphia based digital marketing Startup Gravity Rail Media. Agency Analytics is great to plug all your marketing tools into it and build really easy-to-understand custom reports. I love giving these reports to my partner and to clients who don’t understand the complexities of digital marketing but need to know what’s going on. The software isn’t as in-depth as Marin or advanced for SEO as Ahrefs but given the price tag, it is a really powerful tool to give a birds-eye view of all your processes. It also has handy built-in keyword tracking and site audit tools. For effective startup marketing, you must check out Google Webmaster Tools. 15. Levi Sanchez is the Co-Founder of Millennial Wealth. To market my startup, Financial Planning firm, I found Yoast SEO, Hootsuite, and Mailchimp to be effective startup marketing tools. Yoast SEO is a plugin for WordPress that helps you optimize blog posts for SEO purposes. It’s a free plugin, and a great learning tool to get your feet wet in understanding the SEO world. HootSuite is a social media management tool. The free version limits you to 3 social media profiles, however, it saves you A LOT of time when scheduling social posts. You can also see the analytics and reply to messages on the HootSuite platform rather than going into each individual social profile. Lastly, MailChimp is a free email management service. You can build email lists, automated emails, landing pages, and more. It’s an easy, free to use tool that helps you stay in contact with customers/leads through email marketing or newsletters. 16. Rob Braiman is the founder and CEO of Cogent Analytics. We at Cogent have begun to build our marketing effort from scratch. We have been using a suite of tools that address the digital platforms to engage clients. These include a database of well-built websites with WordPress, then HootSuite for social postings, MailChimp for eNewsletter blasts, and to measure our effectiveness, we use Google Analytics and SEM Rush. Also, to build lists, we use contacts from our call center CRM software, VanillaSoft. We have a database of contacts to draw from already in our system, which we have purchased from sources such as Hoovers, and DatabaseUSA. Google Analytics together with more in-depth analytics like SEMRush provides us with a plethora of data about our website usage, overall site health, and how we stack up against our competitors. 17. Tripp Rockwell is the Chief Marketing Officer at DNA Behaviour. As a small, entrepreneur-led business, our time is spent wearing multiple hats and drawn into so many different projects and meetings. We spend a lot of our time to engage with clients and prospects. To keep things moving smoothly, we rely heavily on Appointlet. The link to our personal calendars for people to self-register for planned meeting windows, plus being tied to our RingCentral (phone) and Zoom (web-meeting/webinars), means we’re only 1-click away for interacting with our teams, clients, and partners with full web capabilities while on the go. And with RingCentral tied to SalesForce, each call/meeting is captured for future reference. 18. Zach Hendrix is the Co-founder of GreenPal. Email is still king for startup marketing and we have tried pretty much every major email marketing tool out there. Previously, we relied heavily on MailChimp and Send in Blue. We have switched to Get Response and have not looked back since. Most email marketing tools are set up and geared for newsletter campaigns, but Get Response is built and designed for sales email efforts. Our needs were to reach out to local realtors on our email list and to sell them our new tool to manage their portfolio of rental properties and Get Response gave us the tools to do just what the name says, get a response and ultimately close the sale. I use two marketing tools in tandem to do some amazing keyword research for SEO. And they are free! Find Ubersuggest suggestions about related topics that you can potentially write about, and pick a few to test out. Under each listing, the Mozbar will tell you the Domain Authority of each result. See if you find any website ranking in the top 10 results that is less than a 10 “DA” score. Anything under 10 is considered to be a pretty easy keyword and it’s worth putting on your editorial radar if you have a fairly new site. Pixlr is an amazing solution for simple image editing. This is a fast-loading and feature-rich tool that is easy-to-use and is free to use. I used IFTT (If This Then That), to send me a text every month so I don’t forget anything. IFTT is good at creating a simple workflow from one app to another, and it works with Amazon Alexa! It is an easy-to-use app that is free to operate. The biggest asset in getting our business off the ground is CRM tool Podio. It’s very popular in the real estate space but is flexible to be used in many different areas including all types of sales. It has free capabilities up to 5 members and needs to be upgraded for advanced options. It serves for us as a lead management system to organize all our incoming leads. With our business, as house flippers, there are a series of over 30 tasks that are all repeatable from start to finish on each house we purchase. Podio, the way we have it setup, alerts us of each task to a different team member. When that team member completes the task it then assigns the next, and so on. It also has a many follow-up sequences which enables us to stay in touch with all our leads from 6 months to a year after they first become a lead; we use a variety of avenues from text, email, direct mail and ringless voicemails. We also use paid Google advertising with Pay Per Click (PPC) which has had solid results. 22. Trisha Trixie is the Founder of Trisha Trixie and Company. The best startup marketing tools I have found are Canva and Buffer. Canva is a platform that graphic designers have put together for us. Instead of having to hire a designer for $50 an hour, you can create marketing and promotional items yourself for free or at a minimal cost. They have layout templates, text templates, photos, shapes, images, frames and more. I use Canva for everything from when I had a fashion business, to my book cover rough draft to give to my publisher to my Toastmasters materials. Buffer and Buffer for Pablo are my go-to automation Tool. As the Social Media Chair for Toastmasters, as well as managing client social sites and my own, Buffer, helps me manage, schedule and do it all. Pablo by Buffer creates memes and quotes for users to create, use and add to their Buffer queue for great social media marketing. Social media marketing might seem like a daunting task for startups because it can take a lot of time to execute it correctly, but with the right tools in social media marketing can be much quicker and easier. For Twitter, I always turn to Tweetdeck. This is free to use tool can help startups to easily schedule out weeks’ worth of content and monitoring. I love being able to easily see and retweet content from Twitter lists (if you aren’t utilizing this function you should be!). It’s also a great tool for startups who don’t have access to a customer service dashboard yet, with Tweetdeck it’s very easy for CS teams to monitor and respond quickly to customers. We love AHREFS for backlinking and SPYFU to check out PPC spend of competitors and prospective clients. We also use the SUMO APP for social media engagements and email captures. Furthermore, we use Optimizely to split test our content pages. These tools are each a piece of the puzzle to measure how successful our campaign is going. We live and die by data and these resources let us know what is working and what is not. Digital Marketing is not a guessing game and these tools are invaluable to our success metrics. 25. Chloe Smith is Founder and Creative Director at Forty8creates. For email marketing, we use MailChimp as it is simple, and it just works. We use it quite frequently for our Monthly newsletter. We use Hootsuite for scheduling our social media posts. UNUM is a great platform to plan out the layout of your Instagram profile. You want to make sure that all the pics look great together so by planning them ahead on UNUM you can make sure you keep your Instagram aesthetically pleasant. For design, Adobe Illustrator’s easy functionality makes it easy for everyone to use, from the design experts to the communications team, it’s our go-to design software. For a technical overview of our clients’ website, we use the Screaming Frog which gives you an overview of the main elements of a technical SEO audit. It’s as simple as popping the domain in the search bar and waiting for the insights. 26. Shawn Moore is the founder at Solodev and remains a driving force behind the Solodev Web Experience Platform. When getting Solodev up and running, I had a number of marketing tools at my disposal. As Solodev continues to evolve in the CMS and software space and programs come and go, these tools remain largely at the heart of our growing marketing strategy. Hubspot CRM – It’s free, and free forever. This is a great starter CRM and can scale with you as you grow. They’ll also offer some paid PRO features, but they’re not required to be successful. One other awesome feature is the integration that they have with other tools such as Outlook or Gmail, so you’ll know when your prospect is engaging with your emails. Combine it with a proposal tool such as Bidsketch to get a pretty good understanding of when you’re moving the needle on your proposals. MailChimp – Email marketing is still critical for businesses and can offer a solid ROI for startups and enterprises alike. Canva – This tool is a simple drag & drop graphics builder that can help you create useful graphics without having to learn photoshop or hire an artist. Canva users plus buy suggested icons or photos to add to your design for as low as $1. Yoast SEO – If your site is on WordPress, Yoast SEO is one of the best plugins to get you started to optimize for your audience. SEMRush – One of the best tactics a startup can take is to understand their competitive landscape, and there is no tool better equipped for that than SEMRush. Need to know what ads have been served for your competition? Check. What keywords are they ranking for that you are not? Check. Where do you have overlap or need more backlinks? Check. With pricing starting at only $99 monthly, you can’t afford to not have this tool. As an early stage startup, we rely heavily on cost-effective and efficient tools. Two such tools that we absolutely love are Pipedrive for our CRM and Growbots for our lead generation/email drip campaign efforts. Pipedrive is an easy to use CRM tool that allows us to easily store, track and respond to all of our leads. It has a very intuitive user interface for both their desktop version and their mobile app. Pipedrive allows you to import and export lists and integrates with most sales and marketing tools (including Growbots). And it is very affordable! Growbots is a robust lead generation tool that allows you to intelligently target prospects and companies based on location, industry verticals, company size and many other factors. Growbots then provides the ability to construct customized email campaigns to send to your new prospects that include tracking tools and analytics on how people are reacting to your emails. For inbound marketing, we trust Hubspot which is integral to virtually every marketing workflow – from the moment someone visits our website to the hand-off to our sales team. Hubspot also offers a robust Learning Center where both new and tenured marketers can get certified in Inbound Marketing. As an employee-centric organization, it is incredibly important to ensure that new marketers start with a solid foundation. For SEO, an obstacle almost any organization will face is growing the number of an inbound link while maintaining a high quality of links. At TINYpulse, we typically avoid acquiring backlinks through forums, blog comments, and social media sites. To maintain quality, we seek out influential journalists or website content coordinators via tools such as Buzzsumo and Ahrefs. 29. Isaac Lekach is the CMO and co-founder of influencer marketing platform, REP.
With regards to our favorite startup marketing tools, we really like Reply.io. It is terrific for executing and tracking the efficacy of your email marketing efforts. The second is REP. One of the greatest ROIs we saw when promoting our platform was when we used our own platform to help grow the user base; we hired from within and had our early adopters replicate our message on their social channels. 30. Vivek Chugh is the Founder and CEO of Listables. Being a small startup, some of our team members work remotely, so any tools that allow us to easily or clearly communicate with our staff from feedback, to final sign-offs, to brainstorm are always a welcomed addition. We recently started using a social media collaboration tool called Planable and we have really been liking it. It has made social media content creation, scheduling and approval process much more streamlined and decreased workload and time for our marketing team. With Planable, you can schedule the content, then suggest changes, and/or approve content all in one place. Email marketing is one of the most important marketing channels for small businesses – you’ve heard “the money is in the list” and you need a great tool to nurture that list! I chose MailerLite for email marketing and outreach and it has a fully-featured free plan for up to 1000 subscribers and offers reasonable prices as you scale up your list. MailerLite also offers visually appealing and responsive email templates as well as the ability to design your own if you want to match your branding. It also has easy-to-understand analytics, which helped me to see who was opening my emails, and what links and information were of most interest to my subscribers. Small business marketing usually makes heavy use of social media, and one of the important items with social media posts is to catch the reader’s eye. For this, you need a tool to design captivating branded images. A great option for this is Canva. Canva has a free version which allows you to create and save your images to the appropriate size for your chosen social media platform. It has several free templates and also includes tutorials to not only help you learn to use the tool, but also to help you create professional-looking designs. Buffer has had a major impact on the effectiveness of our social media. Scheduling, analytics, cross-platform use of content and reporting effective content from the past is all easy to do using the Buffer platform. Being able to “buffer” a tweet or post at all hours of the day and have it show up during our peak business hours, along with consistently delivering RT/shared and original content every day is effective and efficient. Buffer also has a full stop button to halt all social media post during tragic events or other important periods. Buffer also allows for multiple team members to work on the same account at the same time. We post original content on multiple social media channels easily and have the ability to adapt each post for length, style, accompanying photos and videos to make each post as effective as possible. We started with a free account but soon upgraded to a paid account to add more of our social channels and additional tools. The increased effectiveness of our content aggregation and dialed-in timing has more than paid for the additional cost. We constantly hear from friends, clients, and peers that our social media posts are “everywhere” and being noticed since we committed to the use of the Buffer app. 33. Christina Gray is a seasoned marketing strategist with over 15 years’ expertise in using savvy marketing solutions. For networking, relationship building and marketing your services and expertise in an approachable way, invest in, and build your brand, through LinkedIn. The social platform has increased its following by 1,000% over the last 13 years and it’s only positioned for more growth moving forward. If you’re looking for affordable and intuitive design resources, Canva is a free design tool that offers a generous selection of pre-made templates or DIY options for business card or logo development, presentations and a variety of other marketing collateral. As another consideration Fiverr is a marketplace featuring freelance design services from creatives around the world at very affordable rates. 34. Katie Vahle is Chief Commercial Officer at Carevoyance. SalesPipe for email marketing. The SalesPipe team identifies prospects based on our targeted customers’ profiles and executes all the outreach and follow-up. They deliver high-quality meetings for our sales executive to close. 35. Jack Saville is an Online Marketer at OnBrand Magazine. As a startup with a limited budget, you want to make sure you’re making a return on every dollar spent. So, start capturing leads as soon as you register your domain name. You don’t even need to wait for your website to be built. Using a cheap CMS, create a one-page website. Then using a free an embeddable form (like SurveyGizmo), you can start capturing details of potential future customers as soon as they start arriving on the site. Another helpful (and free) startup tool is Bynder Orbit. Bynder uses Ai to help keep your files organized and easily retrievable. Images are scanned by AI upon upload, and tags are automatically created based on the contents of the images. And finally, once your site is live, it’s important to maximize engagement with your visitors straight away. A great tool for this is Appcues.com. The easy to use Appcues UI makes it possible for anyone on your team (with or without technical expertise) to add tooltips, modals, hotspots and other features to web pages to help increase visitor engagement. Our favorite marketing tool is by far CanIRank SEO Software. We tried a few different marketing and SEO tools and found that CanIRank is especially helpful for startups that are hurting for time and resources (like us). Rather than spending time sifting through raw data, CanIRank gave us DIY step-by-step instructions for optimizing pages, link building, and content writing. It’s really demystified the SEO process and helped streamline all of our digital marketing efforts. Based on CanIRank’s recommendations we’ve developed a system to produce high-value content that supports SEO initiatives, gains quality backlinks and betters user engagement. Before publishing, we also use Yoast SEO plugin for WordPress. Yoast checks for readability and the presence of your primary keyword. This saves us a ton of time with optimizations and ensures that we’re appropriately targeting our keyword. Since using the Yoast plug-in and CanIRank we’ve seen our organic traffic move from almost 0 to well past any previous expectations. We’re also ranking on page one for a number of our most important keywords, enjoy a high website relevancy (making it easy to rank for related terms in the future), and have seen a dramatic increase in conversions. 37. Maksym Podsolonko is CEO of Eazyplan. My favorite SEO tool is Ahrefs. It offers the most robust set of functions, simplifying all our activities in content marketing, SEO and influencer outreach. Although it is quite expensive, it does deliver the results that we need. Streak is our choice for lead management and CRM and it makes Gmail an effective CRM. As it is integrated into Google Apps, many of the actions are automated out of the box and save us tons of time. It allows simple collaboration between accounts and is the main tool of our sales, marketing and customer success teams. Our email marketing is largely automated by Mailster – a WordPress plugin that integrates with all major email delivery services and has the majority of MailChimp features. Hootsuite helps us plan posts and monitor engagement on social media. The all-in-one solution it offers is perfect in case of smaller teams like us. All our design tasks are concentrated in a single tool – Figma. It allows us to collaborate on design, use a shared library of elements to quickly put together consistent layouts, create basic animations for prototypes, test the UX and get feedback all in the same place. SEO – If you’re using WordPress, Yoast SEO can be a very useful tool. Ahref, Open Site Explorer, SemRush are all very useful for competitor research, backlinks, keywords research and sorting bugs and technical issues. CRM / Email – Mailchimp is a great email marketing tool. Social media – You can consider Google AdWords, Facebook Ads manager, Linkedin ads, and Twitter ads for social media marketing. Design – Upwork and Freelancer make for great design tools and definitely worth it. Hubspot is one of the best startup marketing tools. It integrates all the marketing basics required by a startup in one platform and provides you everything to build relationships with your customers. You can start using this tool for free and upgrade later as you grow. Using HubSpot’s SEO and content strategy tools, you can grow your traffic, convert leads, prove ROI and never miss an optimization opportunity. HubSpot CRM helps you gain deeper insights into every customer and lead; to organize, track, and nurture them. Email tracking tool notifies the moment a lead opens your email, track every interaction automatically, and organize all your activities in one place. 40. Isaac J. Kassin is the Co-Founder at Exeq. I recommend startups and SMB’s to extensively use Facebook for their marketing activities. Facebook is powerful for both paid marketing (digital ads) and free marketing (messaging and growth hacking). For paid marketing, start by making design-pretty and clear ads that are specifically designed for your market, and then choose them in the targeting section. By doing so, your bid cost will be as low as possible with the highest conversions as Facebook charges less money for relevant ads going to the right audiences. 41. Dave Hermansen is the owner at StoreCoach. We’ve tried pretty much every tool out there and the only one that does almost everything we need it to do is the SEMrush Tool Suite. Perform keyword research where we can see how many people are searching for a seed keyword that we enter and how difficult that keyword will be to rank for. Not only that, it also returns the related and long tail search phrases along with their competition scores. See which keyword phrases are working best for our competitors. See what backlinks our competitors have so that we can target the same websites, hoping to also score a backlink. See what our competitors’ ad spend is on various channels, what they are bidding on and how well those ads are performing for them. Track the progress of all of our websites’ targeted keyword phrases as well as the backlinks we have obtained. Analyze our site’s content for missing opportunities. 42. Kean Graham is the CEO of MonetizeMore. Ahrefs: We’re using Ahrefs to learn and understand our competitors’ website. We’re using the tool to investigate their current backlinks, top pages and SEO metric based on the Ahrefs algorithm. We also use the Ahrefs SEO metrics called Domain and URL ratings since Google PageRank is no longer getting updates. With those numbers, we identify how strong or weak are the websites of our competitors’. LongTailPro: We use LongTailPro to give us a glimpse of how much monthly search volume a keyword has, and our favorite part is the Keyword Competitiveness. This metric gives us an idea of what long tail keyword is easy or difficult to rank in SERPs. ScrapeBox: This tool is so popular to SEO Blackhat community because you can build thousands of backlinks through blog comments in just a matter of few days. However, this strategy can lead to Google penalty and most experienced internet marketers sees it as an “old school” SEO tactic. The optimal way to manage your online marketing strategy is by combining the power of Kajabi and a WordPress site. WordPress has a ton of flexibility and different plugins that can be used to customize your site in any way you want. Now that you have your site and your leadpages set up, it’s time to start getting the word out there. The best way to get your ads in front of as many people as possible is by leveraging the power of Facebook Ads. Facebook has a relatively new feature called the “Facebook Pixel.” It is a small piece of code that you can attach to your Facebook site (and your Kajabi site) to keep track of who is visiting your site. This information is GOLD for retargeting. For example, if you put out a Facebook Ad guiding your audience to a blog post, you can then target a new ad to people who have seen the blog post by inviting them to a webinar. It’s important to understand the keywords your audience uses, but not just for search-engine optimization purposes. Solid keywords provide ideas for new content pieces, pages on your website and even products or features for your startup. Ubersuggest is a free keyword tool that gives you tons of suggestions based on your topic. It’s like an enhanced version of Google’s suggestions. Reddit is a tight-knit community of active Internet users. It’s an unspoken rule that if you spam the site with promotional nonsense, you’ll get slammed by the site’s users. But that doesn’t mean you shouldn’t use it. Becoming an active part of the Reddit community is a great way to get advice, ask questions for a blog post and/or understand your target audience on a much deeper level. 45. Geoff Roberts is Co-founder of Outseta. As an entrepreneur, there are so many great tools for startup marketing; so much so that this can actually be a problem. I Co-founded Outseta – a platform that fully integrates CRM, email marketing, customer service, and even billing tools. It’s awesome for startups because it’s free to start, then just $99 per month for unlimited users, contacts, and emails. This gives entrepreneurs predictable low overheads and a complete picture of the customer journey without needing to evaluate, buy, integrate, and maintain a handful of software tools. What is your favorite startup marketing tool? Share with us in the comments below! Looking for a startup domain name? Find it on .TECH! Nice article. One of my favorite on SEO is serpstat with their API and Canva / DesignBold. I’d have to recommend Cocolyze for startups (https://cocolyze.com – it’s an SEO tool with rank tracking, serp & competitor analysis plus analyzes all the factors that could impact your rankings. Good interface, very user-friendly and reliable results! Great tools. Thanks for sharing such tools.